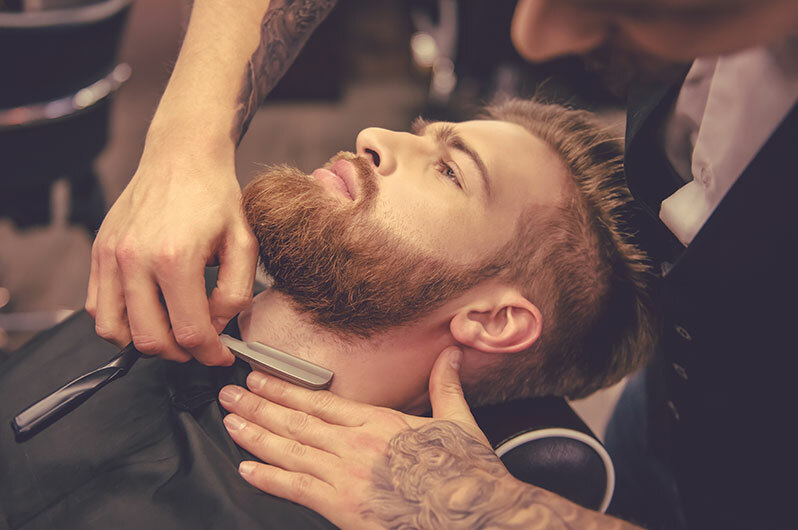 Many men today are re-discovering the fine art of a straight shave and ditching their disposable razors for a more traditional way of facial grooming. Shaving is an important ritual that most men deal with every morning. A good shave is a sign of class, maturity, and style. A professional man is always well groomed and his shave should always be on point. A straight shave is a great way to achieve this look. A razor cut shave is a classic technique used for many years to achieve a smooth, well-groomed look for men. Unlike a two-blade safety razor, a straight razor is a single blade razor that is very sharp and when it is not used it is tucked away into a protective handle. Straight razors give a very close shave that results in the smoothest skin possible. Using this method allows for clean, even lines of facial hair to achieve a well-groomed, manicured beard or mustache. Rediscover the luxury of an old-fashioned shave with X5 Cuts. There are a few steps to achieving the ultimate razor cut shave. At X5 Cuts, our skilled barbers are professionally trained and experienced in the art the straight razor. At X5 Cuts, a straight shave is always accompanied by a relaxing hot steam towel and a soothing hot lather facial massage. Before any shaving begins, one of our friendly barbers will seat you into a recliner seat and allow you to relax. They will then place a pre-shave moisturizing cream to prep the skin followed by a gentle lathering cleanser on your face so that it softens the skin and the hair follicles to allow for an easy, close shave. The barber will then place a hot towel on your face. This relaxing step allows for the hair follicles to become soft, smooth and easy to manage. They will then apply a high quality, salon standard shaving cream and begin to shave your face. They will always shave with the grain to avoid any ingrown hairs from forming. To finish the session, they will apply a soothing after shave cream and you are all set and ready to go. Our skilled professionals always make sure to shave your face carefully and masterfully so that your shave is top quality. We believe that our clients deserve the best quality service that is useful and relaxing as well. We enjoy knowing that our valued customers take time out of their day to invest in a soothing grooming ritual at our salon. We pride ourselves on providing consistent quality at an affordable price. If you have never tried a straight shave before, we highly recommend that you try one at our salon. You will surely be impressed at the attention to detail and standard of quality that our barbers are committed to. To book your straight shave appointment, call us today!